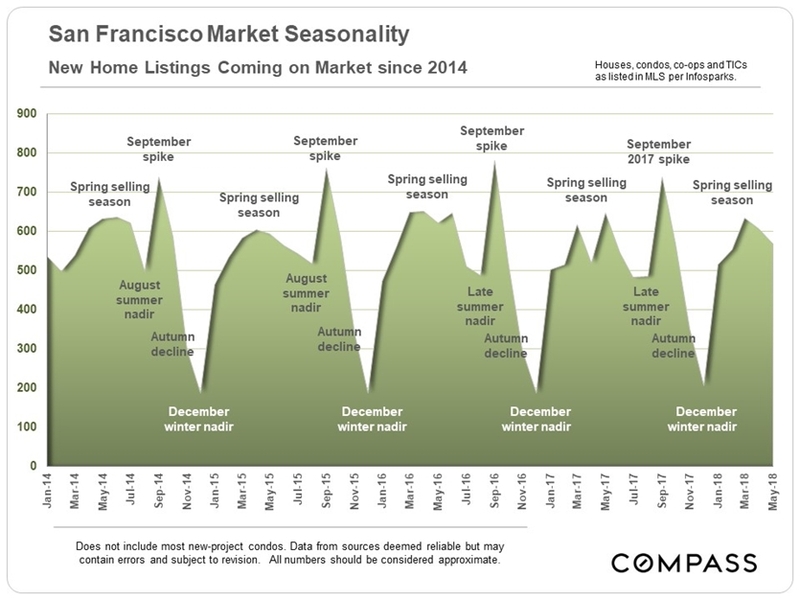 While we wait for the autumn selling season to begin in September, this report will take a look at SF and Bay Area market trends from a variety of angles, starting with home prices. 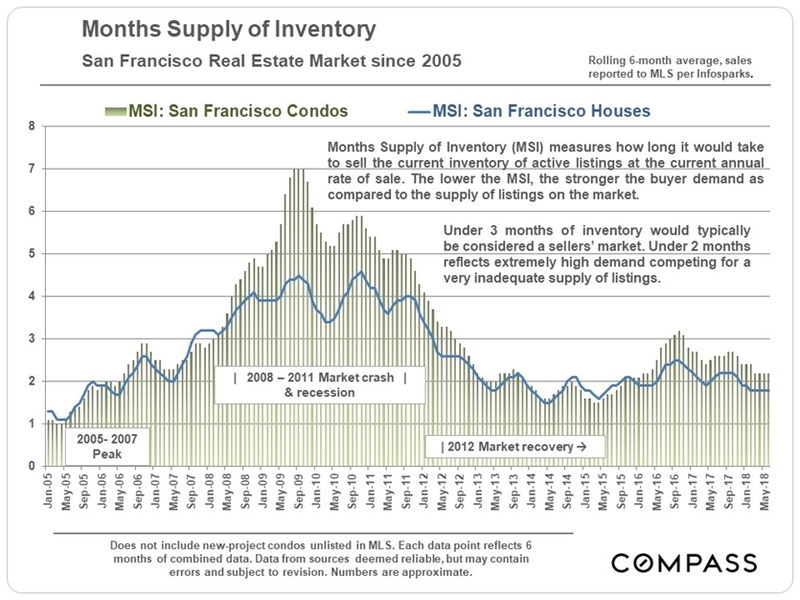 Inventory and demand ebb and flow dramatically in the SF market, as illustrated by the two charts below. 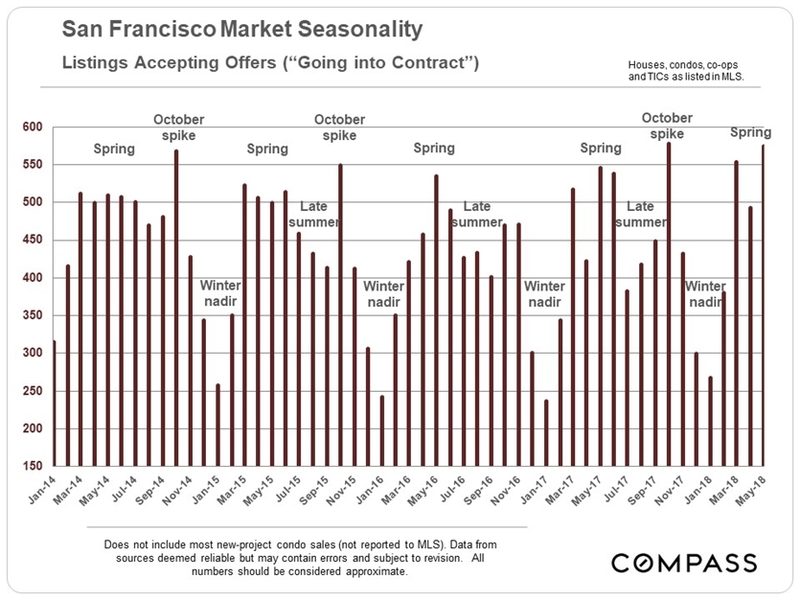 The spring selling season is the most active overall, a period in the Bay Area that can stretch from late February to mid-June. The market then slows down for the mid-summer holidays. Autumn is the second major selling season, but is much shorter, running from after Labor Day to early-mid November. Activity then plunges for the mid-winter holidays. Because of this dynamic, September is usually the single month with the greatest number of new listings coming on the market, providing buyers with the widest choice of homes until spring rolls around again. The luxury home market is even more fiercely seasonal than the general market, which will be discussed later in this report. 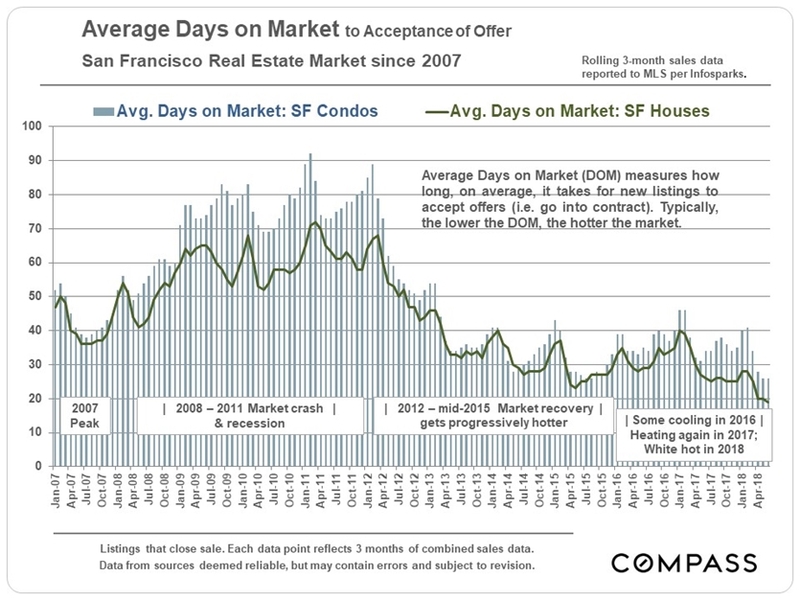 October surge of listings going into contract (second chart). 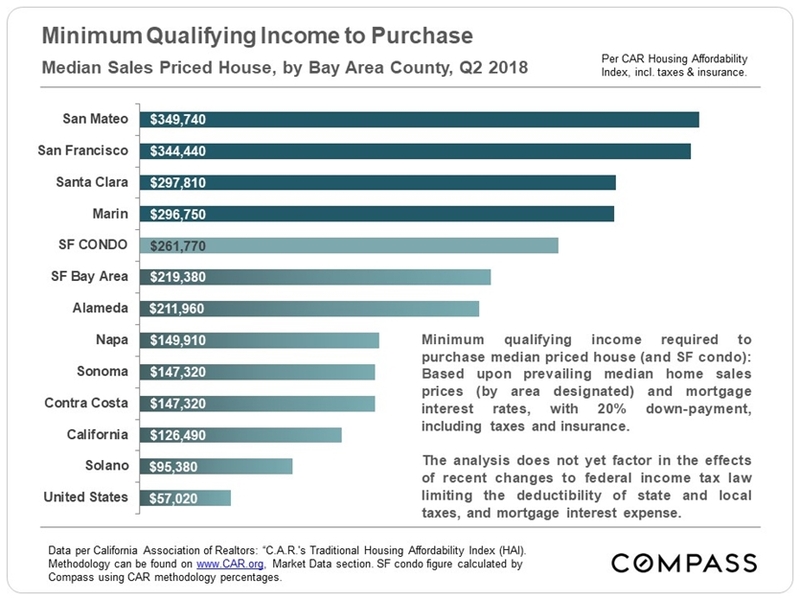 The California Association of Realtors just released its Q2 report on housing affordability, which we have illustrated in the 2 charts below. 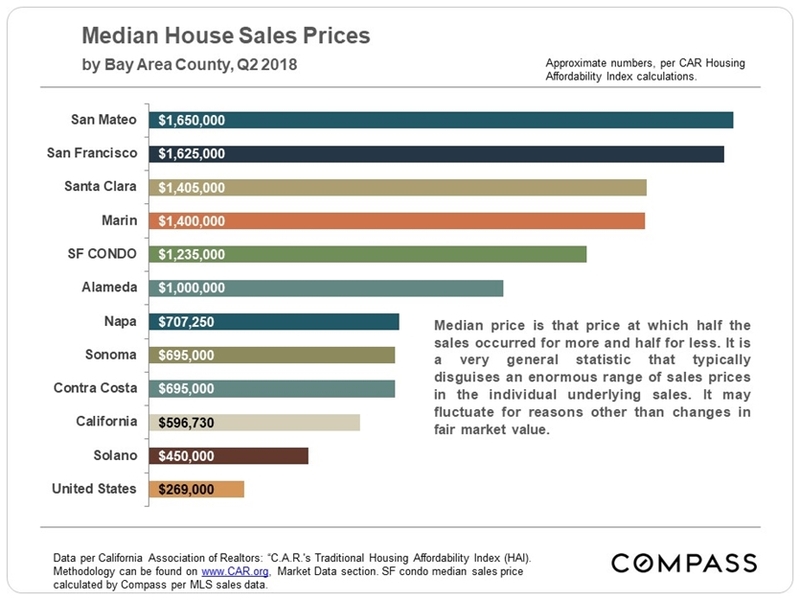 The numbers tie into the county median home prices delineated in the chart near the top of this report. 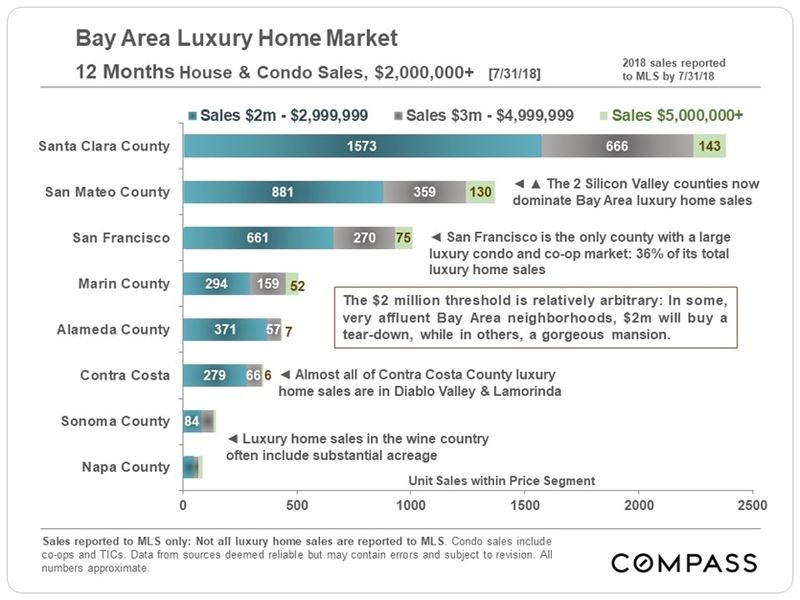 With the continued growth of high-tech – exemplified by rapidly expanding companies such as Apple, Google and Facebook – Santa Clara and San Mateo now dominate Bay Area luxury home sales. Santa Clara has the biggest population in the Bay Area and the 2 counties combined have 3 times the population of the city of San Francisco. San Francisco is the only county that has a substantial luxury condo market, which adds a different dynamic to the mix. As mentioned earlier, the luxury segment is fiercely seasonal in its supply and demand ups and downs. This next chart measures the number of new listings coming on market by month. It is not unusual for luxury house sales to peak in October, fueled by the rush of new inventory in September. On the other hand, luxury condo sales typically peak in May or June, feeding off the spring rush of new listings. The high-end market generally crashes in activity from before Thanksgiving through January, so the short autumn period is considered the last major window for sales until early next spring. The highest end of the high-end market consists of house sales of $5m+, and condo and co-op sales of $3m+. 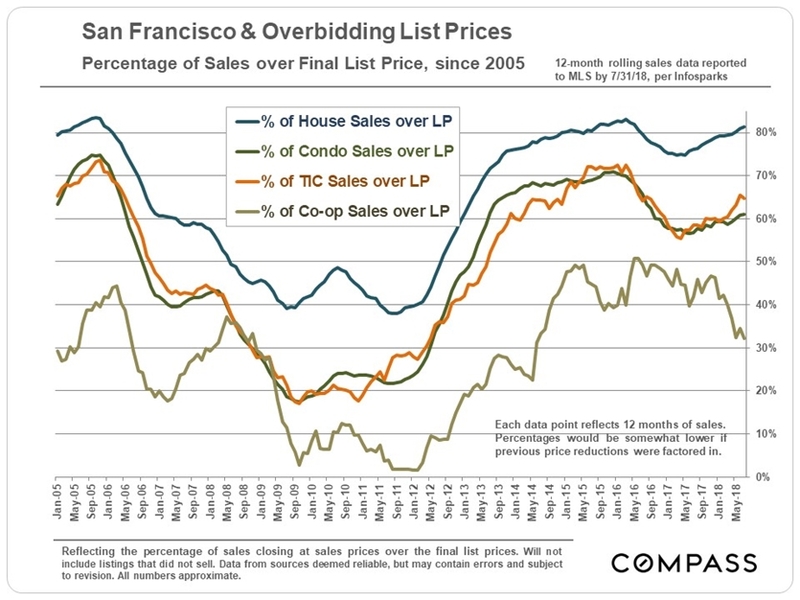 These sales constitute about 2.5% of SF home sales. 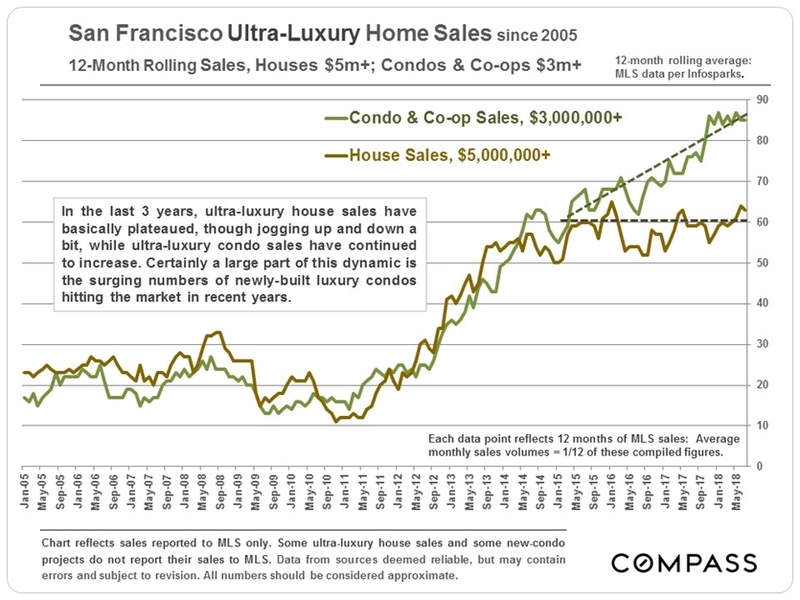 There has been a big surge in luxury and ultra-luxury condo construction in recent years, providing the basis for increasing sales, while ultra-luxury house sales have mostly plateaued in recent years (very little new construction). Many new-project condo sales are not reported to MLS, upon which this next chart is based. 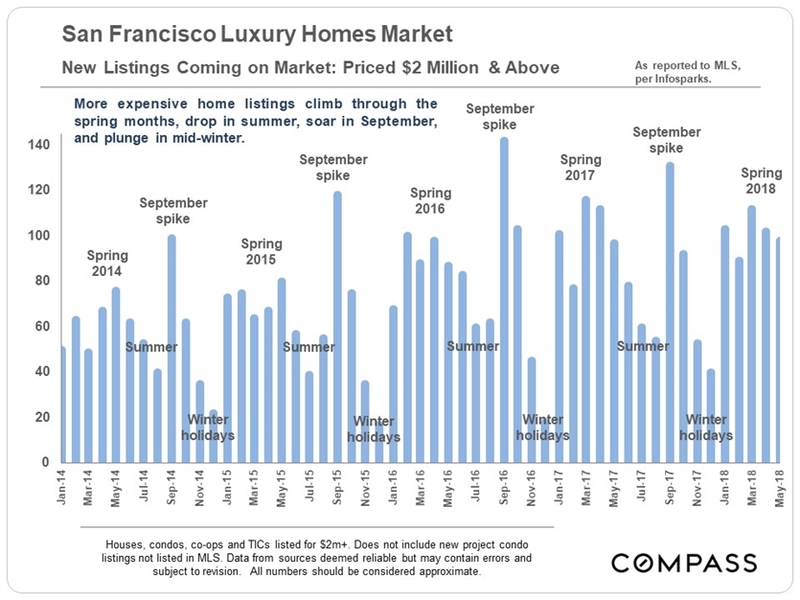 Generally speaking, the SF luxury home market cooled significantly in mid-2015 due to a number of economic events (Chinese stock market crash, oil price crash, Brexit, big drop in IPO activity and high-tech hiring, presidential election fears), before picking up again in 2017. 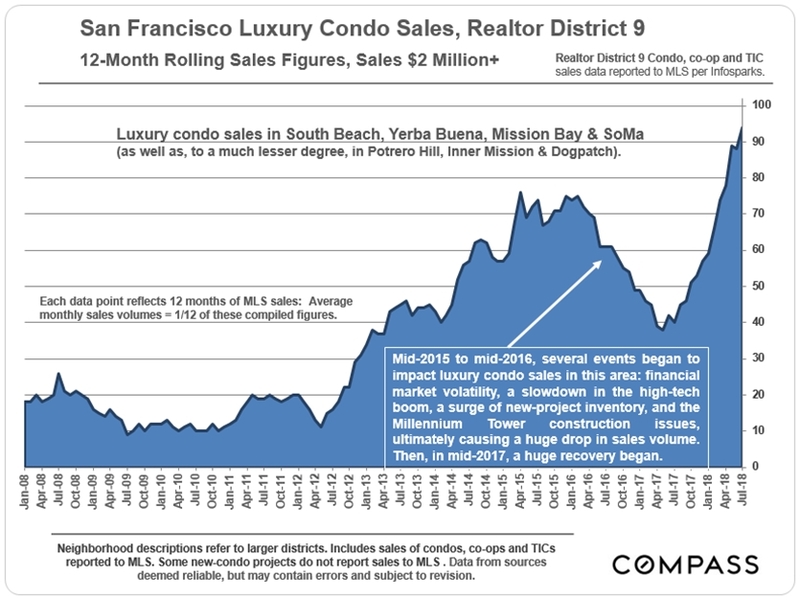 The luxury condo market in the greater South Beach district, running south from the Financial District and Market Street, was hammered by these events plus a number of other factors, which are delineated on the below chart. After peaking in 2015, sales volume (as reported to MLS) suddenly dropped almost 50%: Agents sometimes reported no one showing up for open houses. Then in 2017, a recovery began that has now brought sales back up to a dramatic new peak. (Sales not reported to MLS would further increase recent sales volumes.) One of the big dynamics in this district is the competition between newly built, luxury condo listings and resale listings. Whether new or resale, almost all of these properties are in gorgeous, high-service, high-rise buildings, often with staggering views. As the market get hotter, listings sell faster. 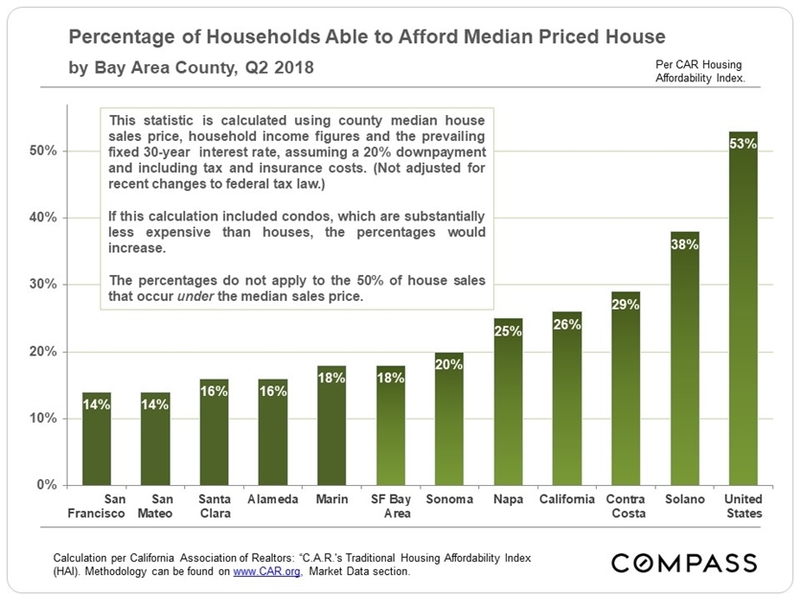 The entire market has been very strong – these percentages are staggeringly high – but the house market is hotter than that for condos and TICs due to supply issues. 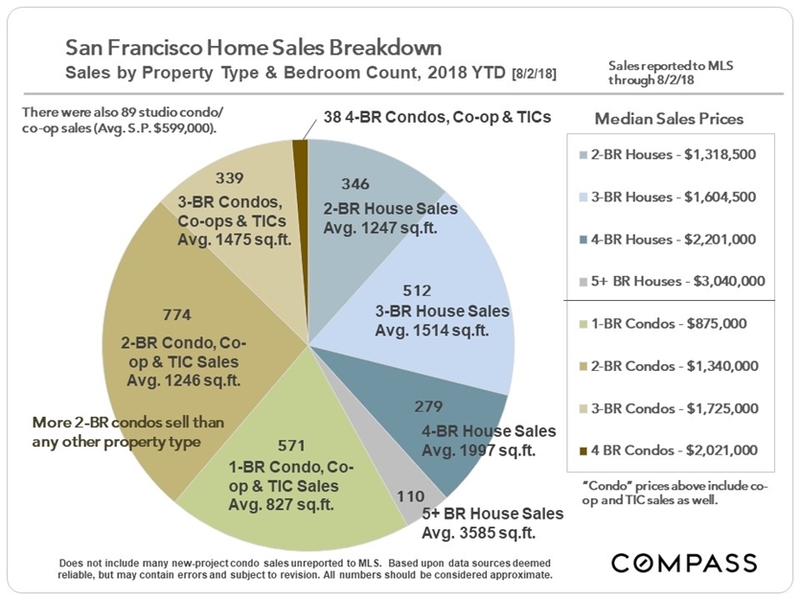 The very small co-op market in SF is dominated by very expensive listings, and the luxury market is almost always softer than more affordable segments: The pool of buyers for the highest priced homes is clearly much, much smaller. And, frankly, luxury home listings are more prone to overpricing, which drastically affects response. The stronger the buyer demand as compared to the supply of listings available to purchase, the lower the MSI. 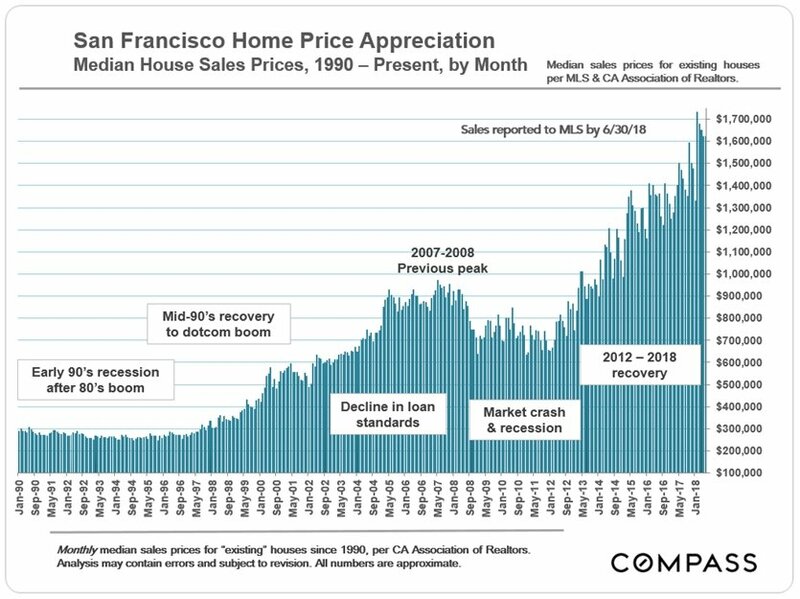 Generally speaking, MSI figures around the Bay Area have been flirting with historic lows in 2018. Two of the factors that have worried market analysts have been the big changes in federal tax law limiting the deductibility of state and local taxes, and interest rate expenses – changes that affect more affluent, higher home cost areas like ours most dramatically – and increasing interest rates. So far in 2018, buyers appear to have shrugged off any such concerns, and dollar-appreciation rates have actually accelerated since the beginning of the year. 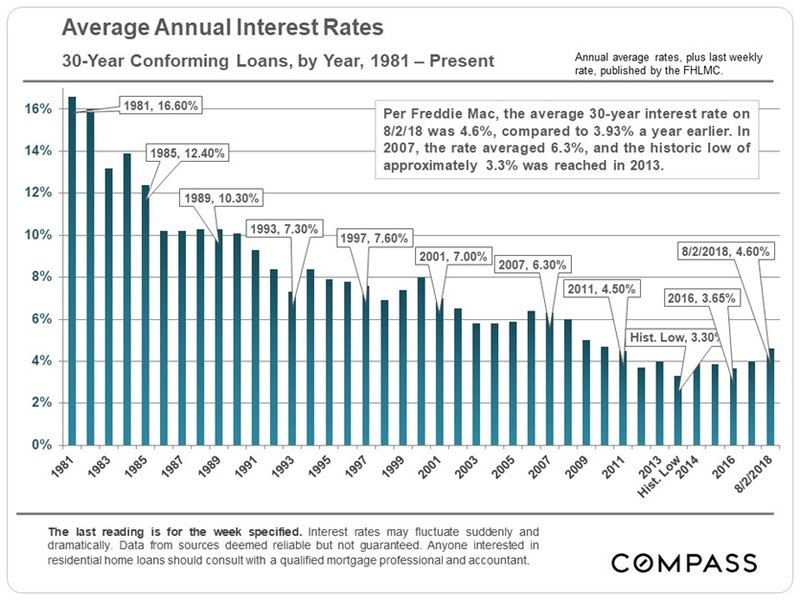 Interest rates play a big role in housing affordability, and their plunge after the 2008 crash played a vital part in the market recovery of the past 6 years. 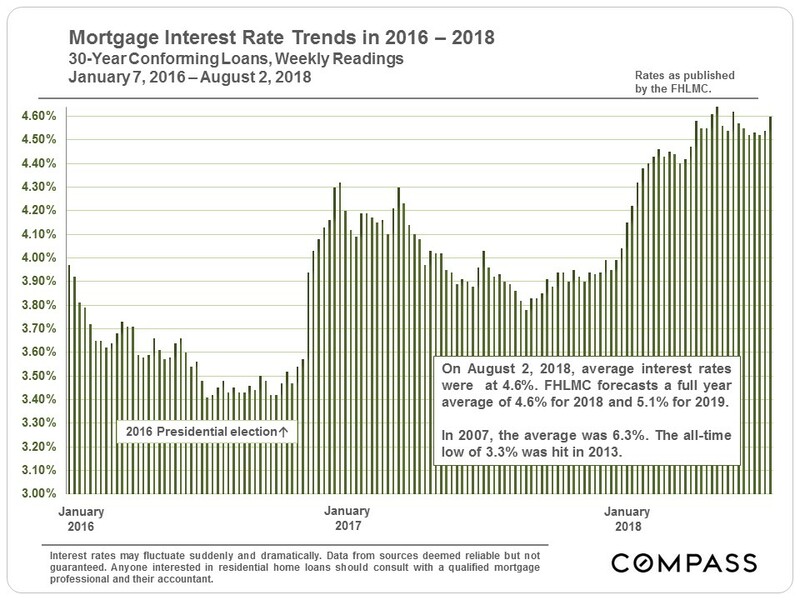 It has typically been very difficult to predict interest rate changes with any accuracy, though most economists believe they are headed higher. The questions being: If so, how high? And how will buyers react?